Safety and convenience are of paramount importance to most drivers when they are reversing or manoeuvring their motorhomes. Xvision Reversing Systems detect objects that are often unseen by the driver, such as low walls, bollards, or even pedestrians and makes manoeuvring safer and easier. Xvision’s unique system for motorhomes utilises the vehicles existing wiring, enabling the system to be fitted even after the motorhome is fully fitted out. The sensors are fitted at the rear of the motorhome and the display is installed into the cab. The Xvision Reversing System for motorhomes uses unique DataCAN signal technology with our Vehicle Powerline Communication System, which allows the system to be installed on both new and pre-owned vehicles without installing additional wiring the whole length of the vehicle. Xvision is automatically activated when reverse gear is selected. The ultra-sonic sensors emit a beam, which will detect objects up to 150cm at the rear of the caravan and up to 60cm at the corners. As you reverse, audible beeps become more rapid and more LEDs will light up. The display indicates on which side of the vehicle the object is. 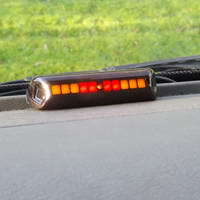 A solid tone can be heard when the vehicle is 60 cm from the object and the central red LEDs light up, warning the driver to stop. 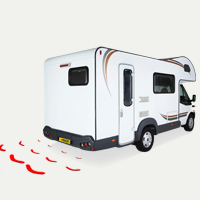 Protects the motorhome avoiding bumps, scrapes and costly insurance claims. 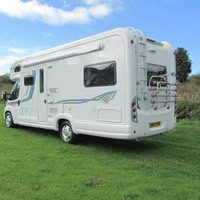 Takes the stress out of manoeuvring, reversing or parking a motorhome. Xvision can be installed on any motorhome, new or pre-owned. DataCAN technology uses the motohome’s existing wiring. Xvision can be added to a motorhome finance agreement. Audio and visual warnings from the Xvision LED Display.